The "Hindus and Others in South Asia and Overseas" research program, hosted by the Center for South Asian Studies of Paris (CEIAS, UMR 8564 EHESS/CNRS), considers Hinduism as a historical point of contact between various religious traditions and ethnic groups. Countless situations of contacts with other religious groups have left their marks on Hinduism, contradicting the ethnic dimension many scholars have focused on. Such relevance of contact in the history of Hinduism is well known in South Asia but must also be analyzed in diasporic contexts. 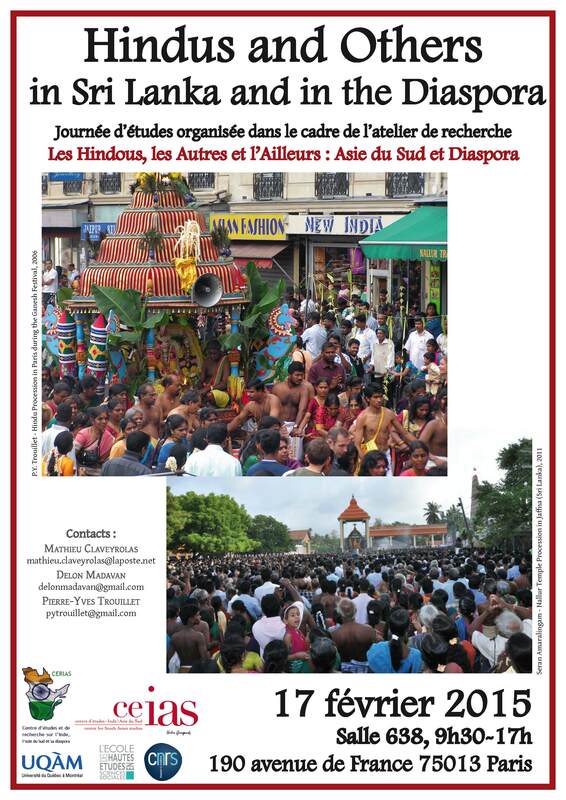 The aim of this conference, co-organized by the Center for South Asian Studies of Paris and the Center for Studies and Research on India, South Asia and its Diaspora of Montréal (CERIAS/UQÀM), is to focus on Sri Lankan Hinduism and to initiate a discussion on how Hinduism and Hindus interact with other groups and religions they encounter on the island and overseas.